Subtropical Storm Alberto 'Is Gaining Some Tropical Characteristics' : The Two-Way The storm, which is moving towards the U.S. gulf coast, is likely to become a tropical storm by Sunday afternoon or evening. 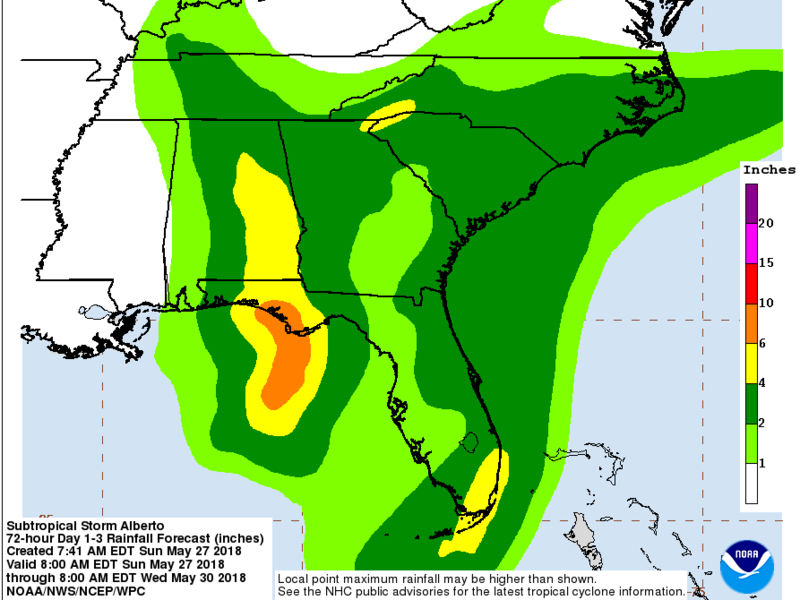 This graphic, created by the National Weather Service, shows rainfall potential in the U.S. gulf region expected from Subtropical Storm Alberto. According to an update from the NHC, the center of the storm is predicted to reach warning areas on the U.S. gulf coast Sunday night or early Monday, but heavy rainfall and tropical storm conditions will reach the area ahead of the storm's center. The storm now has maximum sustained winds of nearly 50 miles per hour. According to the NHC's latest forecast discussion, Subtropical Storm Alberto will likely become a tropical storm by Sunday afternoon or evening. Where and when the center of the storm will make landfall still depends on when the storm makes a northwest turn in the central Gulf of Mexico — but the NHC adds that "users should remember not to focus on the exact timing and location of landfall since wind and rain will continue to spread northward over the northeastern Gulf Coast well ahead of the center." As of 11:00 a.m. ET Sunday, the tropical storm warnings which were in effect for the Dry Tortugas and the north-central gulf coast have been discontinued. As of 2 p.m. ET Sunday, a tropical storm warning is in effect for the area from the middle of Florida's Longboat Key to the Mississippi-Alabama border. The NHC maintains a storm surge watch along the U.S. gulf coast from Crystal River in western Florida to the Mississippi-Alabama border. The water could reach heights of 2 to 4 feet, with the deepest water expected along the immediate coast. The NHC's public advisory also says "a few tornadoes are possible" on Florida's peninsula Sunday. The NHC also warns of possibly life-threatening flash floods and mudslides in Cuba, where Alberto could bring an accumulation of 5 to 10 inches of rain and isolated storm totals of up to 20 inches of rain. On Saturday, Florida Gov. Rick Scott declared a state of emergency for all 67 counties of Florida. In an update on preparedness efforts issued Saturday, Scott said the Florida National Guard has 5,500 guard members on call to help with storm-related emergencies. Alabama Gov. Kay Ivey has also issued a state of emergency, effective 6:00 a.m. local time Sunday, for several counties in Alabama: Autauga, Baldwin, Barbour, Bibb, Bullock, Butler, Chambers, Chilton, Choctaw, Clarke, Coffee, Conecuh, Coosa, Covington, Crenshaw, Dale, Dallas, Elmore, Escambia, Geneva, Greene, Hale, Henry, Houston, Lee, Lowndes, Macon, Marengo, Mobile, Monroe, Montgomery, Perry, Pickens, Pike, Russell, Sumter, Tallapoosa, Tuscaloosa, Washington and Wilcox. Water, not wind, tends to be the deadliest factor in storms like Alberto, according to a 2014 study by Dr. Ed Rappaport of the National Weather Service. Rappaport found that during the 50-year period of 1963 to 2012, about half of all U.S. deaths from tropical cyclones were caused by storm surge. In addition, about 90 percent of the deaths happened in water-related incidents, most often drowning. The Atlantic hurricane season officially starts June 1 and ends Nov. 30. The NOAA's Climate Prediction Center's annual forecast says up to four hurricanes could form in the Atlantic this hurricane season, and that overall the intensity of this hurricane season will probably be near or above normal. According to NPR's Camila Domonoske, even an average hurricane season can be tremendously harmful, especially for places like the Gulf Coast and Puerto Rico, which were hit hard by the hurricanes Harvey and Maria last year.
" 'We know certain areas have been compromised from last year's storm, and that makes hurricane preparedness ... even more important this year,' says Gerry Bell, the lead hurricane season forecaster at the Climate Prediction Center." The next advisory from the NHC will be available at 5:00 p.m. ET.